Remedial massage involves manipulation of muscles and other soft tissues to help ensure that they are healthy and working normally. Bodysmart therapists perform deep tissue massage whereby they locate knots in the muscles and release them. Our service provides a therapeutic environment whereby office workers can take a break out of their busy schedule to relax. Book an appointment or contact us for more information. Our consultations are performed in private treatment rooms located at our St Georges Terrace practice in the Perth CBD. All of our massage therapists have completed a minimum two-year Remedial Massage Therapy Diploma and are fully qualified and experienced. 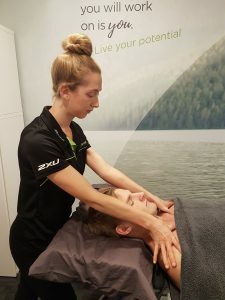 They provide a therapeutic environment whereby clients can discuss their areas of concern and get a customised massage tailored to their needs. Pressure and techniques are varied depending on the client’s needs and responses. All our remedial massage therapists are registered with the Australian Massage Therapy Association; rebates are available from leading Private Health Fund Insurers. To find out if you’re eligible for a rebate please contact your Private Health Fund.